12nos.Volkman saurer TFO machines, each 192 spls, model Focus 100S, year 2006 now in production. We have TFO machine for sale. Spindle pot: 60 mm. Dia. No. of spindle/section: 36 Nos. We are highly acclaimed in this industry for providing an optimum quality range of TFO Machine. 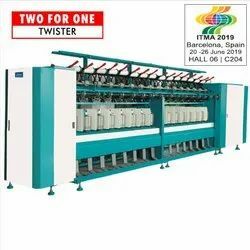 To cater the variegated needs of our esteemed customers, we are highly engaged in offering a wide array of 2 In 1 TFO Twister Machine. We are providing a wide range of TFO Crepe Texturing Machine, which are made from quality raw material. These are available in various specifications and are popular among the customers for their Grey fabrics elastic. 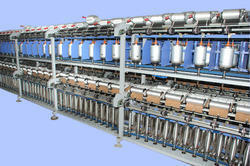 We also offer synthetics yarn TFO twister machine, viscose yarn TFO twister machine. We are also dealing in TFO Cotton Machinery. We offer an array of premium quality Used TFO Machine. 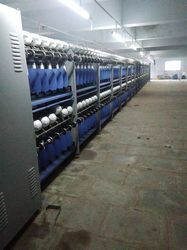 The Used TFO Machine is used for making Two For One Twisting Yarn (TFO Yarn). The Used TFO Machine is durable and has lower maintenance. We offer Used TFO Machine at very reasonable rates as per customers’ requirements within stipulated time.